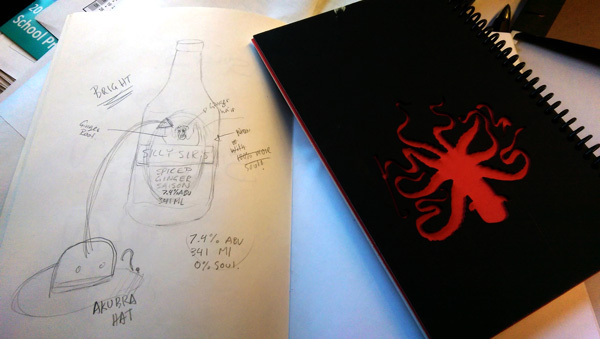 Silly Sir Brewing Co.Homebrew Label Design 101 - A Peek Inside Silly Sir's Labelling Process - Silly Sir Brewing Co.
Until recently, the label design quality of my beer was more consistent than the beer itself. This is in large part thanks to the incredible effort and skills of my girlfriend Sara who is a designer, and who can adapt and adjust my label sketches in all the right ways to make them look great. She's taught me everything I know about what makes good homebrew label design. As I continue to perfect my brewing methods and upgrade my equipment, our beer quality has continued to improve and is now falling in line with our great labels. Members of my local homebrew club (GTA Brews) often ask about our process, and what's involved in designing cool beer labels. GrogTag is a great resource for homebrew label design, but is expensive and doesn't actually teach you about why some designs work while others don't. Labeley is okay too. I say: avoid templates: designing your own labels is easy, cheap and tons of fun. They're clean/sharp - Less is more. Use negative space to your advantage. They properly reflect the given beer style - My cranberry stout has a red label; Giggle Splash American Pale Ale is bright and colourul to reflect the American hops; Old Machine is grounded and bold, like a good Imperial Stout. Low angle, darker colours, and thick font gives it feeling of being grounded. They're clever or witty - While I'm not a huge fan of word puns, most people find them hilarious. 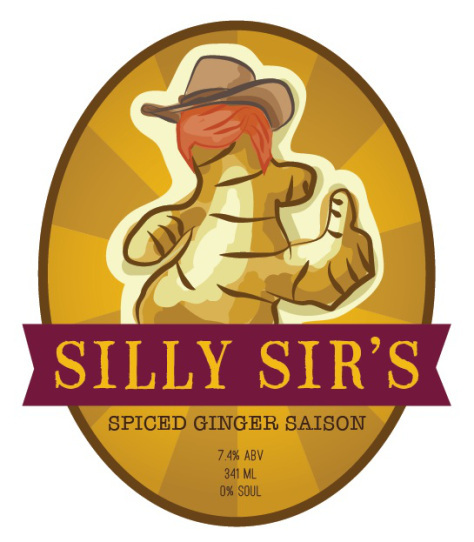 Visual puns are better and more subtle (see Silly Sir's Ginger Saison). Use them to your advantage. Do they need to follow these rules? 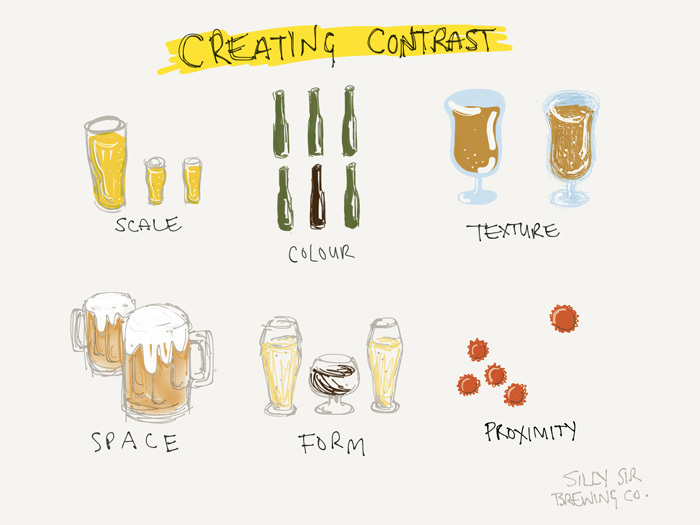 Obviously not (as noted, I think punny labels are over-done and so I generally avoid them), but by keeping these points in mind as a general rule you'll improve your homebrew label designs and ensure your design's continuity. 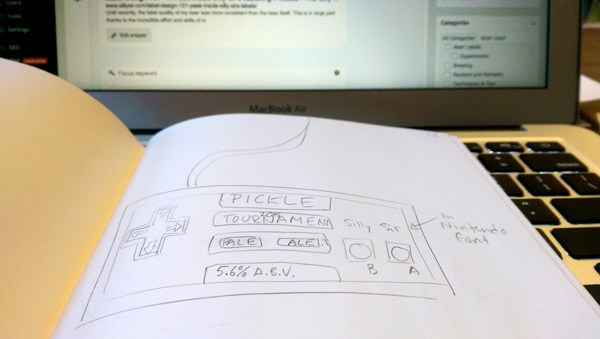 You can create several sketches in a fraction of the time it takes to make just one mock-up in design software. This allows for greater creative output, and more flexibility. You can finalize your best sketch. If you aren't yet proficient with any graphic design software, a visual depiction of what you have in mind communicates your ideas better than words alone. This is especially helpful if you're lucky enough to have somebody else realizing your sketches with design software. Jumping straight into designing your labels on the computer limits your creativity due to your lack of technical skills. 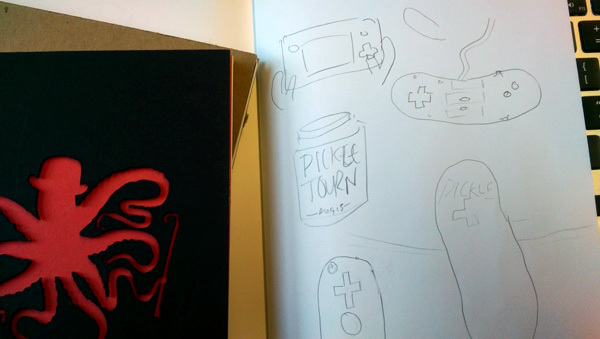 You won't take your design places you otherwise would if you'd sketched it out first on paper. There are thousands of Adobe Illustrator and Photoshop tutorials on YouTube that will teach you techniques on how to achieve various elements in your sketches. Bright and colourful, like the beer inside. Chances are your eye first lands on the ridiculous cartoon image of me riding a unicorn and juicing citrus on its horn. 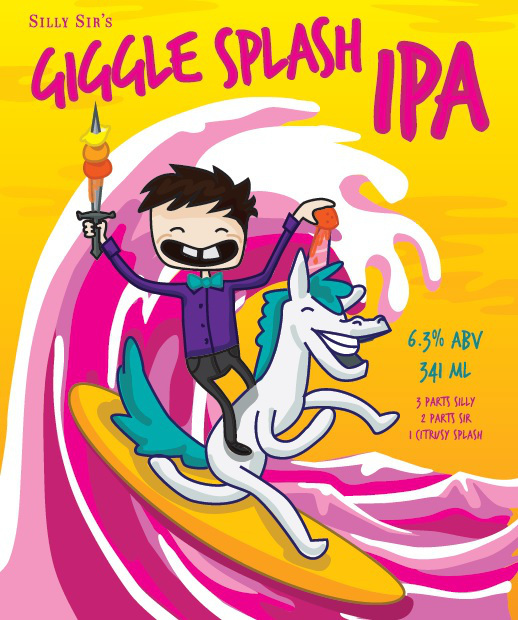 It's then guided by the curve of the grapefruit wave up to the name of the beer Giggle Splash before checking out the rest of the label. Most professionals are proficient in Photoshop or Illustrator. A basic understanding of how these programs work is great since Adobe software allows for the most flexibility and customization. They can however be rather intimidating. 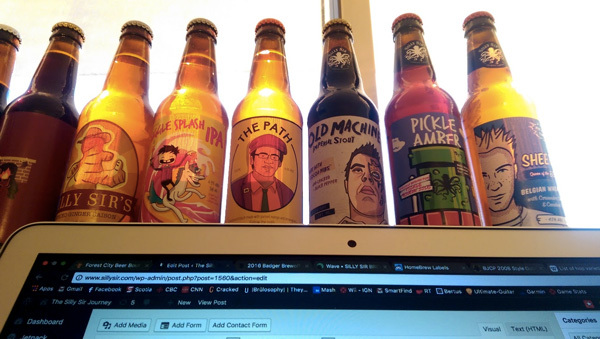 Fortunately, there are many other resources available for amateur designers to create simple graphics to add pizzaz to their beer labels (Canva is one). There's lots of free online tutorials for all these programs. For Sheebah Queen of the Beers!, Sara had to research how to create halftone dots in order to achieve a comic-book aesthetic. Learn about the tools each program has to offer, and experiment around with them a little so that you can use them properly. It's easier than you think. What size are the bottles you're going to be labelling? What are their dimensions? Most Silly Sir bottle labels are roughly 3"x3.5". People shouldn't have rotate the bottle in order to read the name of your beer - it should be readily apparent on its face. Tip: if you have a printer at home, do a test print before sending them off for labelling. Print them at home - buy some proper label paper, and print on your highest settings. Submit your designs to a printing company. 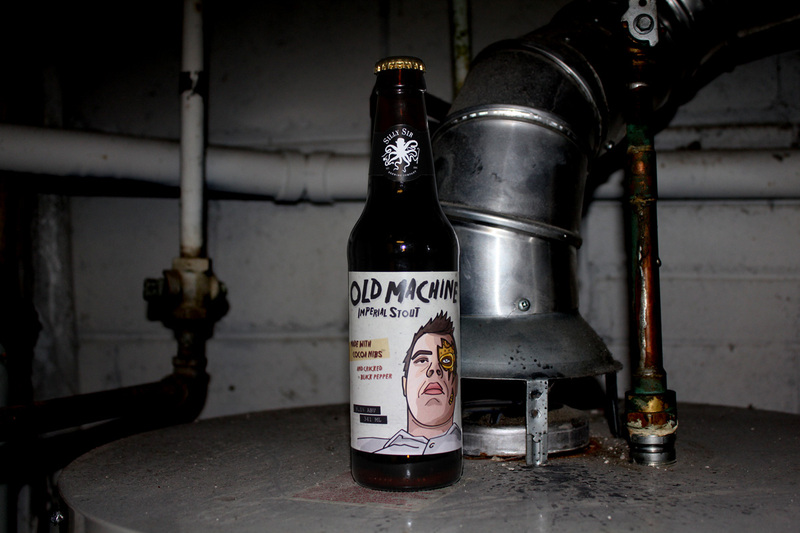 Almost all Silly Sir labels have been printed at The Printing House (TPH) whose locations are abundant in Toronto. They typically charge around $22 for 40 rectangular (3"x3.5") labels. If you're doing a custom cut shape (anything other than a rectangle), expect that price to double since it takes more time, and uses specialized laser cutters. Contact a printing company near you, and they'll let you know what resolution they'd like you to use, or what file types they require (usually .PDF files, but ask them). I advise using TPH over places like Staples because TPH professionals will offer a more thorough understanding of your needs and are ready to help guide you through the process and ensure you're doing it right. 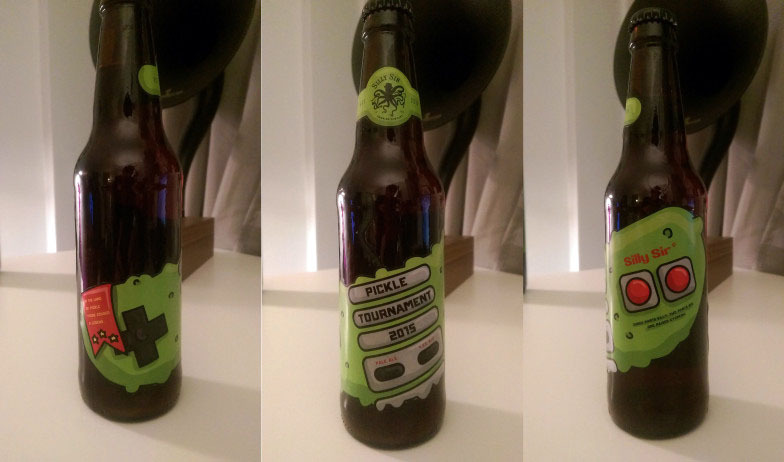 For Pickle Tournament Beer (don't ask) I literally had to cut out each label because doing a laser cut with such detail would have been far too expensive. While this label is one of my most creative, it could be improved. 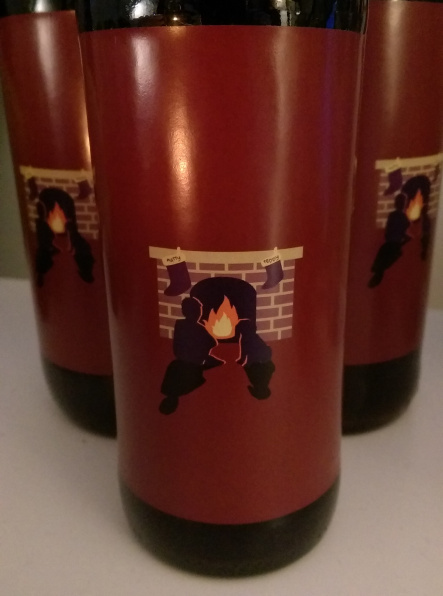 I didn't design for the bottles. Because it's so big, it wraps around and you have to rotate it to fully take it in. Get creative and use construction paper or mixed mediums. One label that really stood out to me simply used bandaids around the neck of the bottle with the beer's name written on it with a Sharpie marker... probably not the smartest choice as bandaid is a common off-flavour associated with homebrews, but it was creative nonetheless. 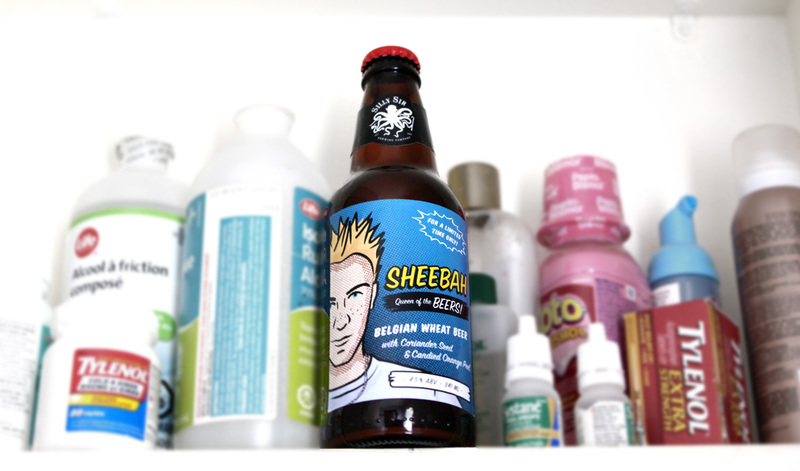 There are several options for actually applying the labels of your beer. If you're printing on high quality semi-gloss paper without a sticky back, you can actually brush the back with milk. Here's a how-to YouTube video explaining the process. While this method will save you money the labels have a tendency to fall off quite easily when exposed to excessive moisture or condensation. When printing at TPH, we often go for their cheapest labels which are simple paper labels. They're easy to apply: I start by applying the label along the centre of the beer, and then smoothing it over outward from the centre with my finger moving up and down along the side of the bottle to avoid bubbles. The downside of paper labels is that condensation can create rippled bubbles when the cold bottles are removed from the fridge. You can also print on vinyl which looks amazing, and is super easy to remove, and doesn't result in any condensation problems. It's more expensive, but can save you time de-labelling since they generally come off in one satisfying peel. You could probably even re-use them which could save you money in the long run (I have not yet done this, so if you do let me know how it worked). So there you have it, folks. While these tips are hardly exhaustive, they should be a pretty good starting point to help improve your homebrew label design. For me, brewing the actual beer itself is half the fun - labelling a finished beer is the cherry on top and takes your homebrews to the next level. Still, it's only when a good label accurately represents a delicious homebrew that I'm truly satisfied (water chemistry is everything). Still not feeling confident you can pull off good design? sara [at] sillysir.com can help. 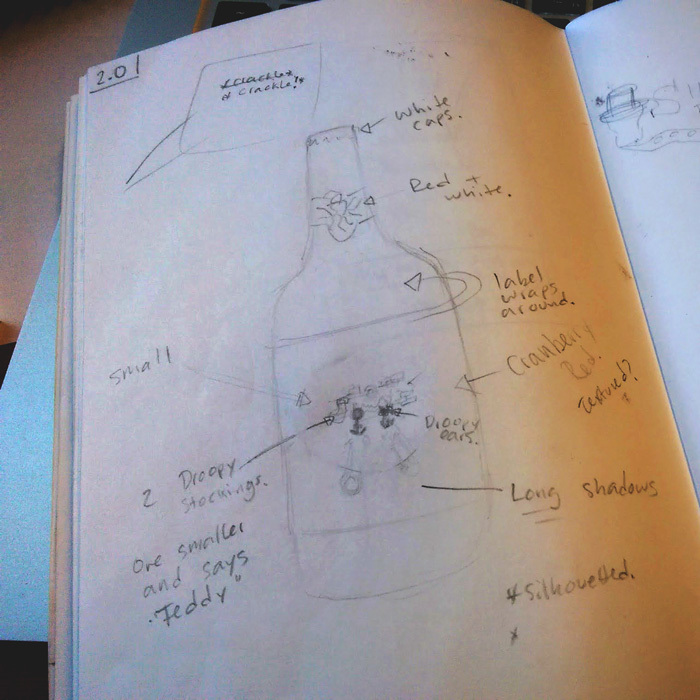 Great write up and helpful since I’m taking the plunge into starting to design my own labels. Quick question. Can you give me some more details on printing? Are you printing to a adhesive backed paper? If not, what are you using to adhere the labels to the bottles? Thanks! I’m just printing at TPH which is right by my apartment. It usually costs around $20-$28 for about 40-50 3″X3.5″ rectangular sticky-backed labels.